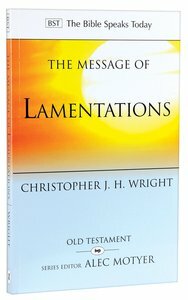 The destruction of Jerusalem by the Babylonians in 587 BC is the likely setting for the book of Lamentations. This was the most traumatic event in the whole of Old Testament history, with its extreme human suffering, devastation of the ancient city, national humiliation, and the undermining of all that was thought to be theologically guaranteed - the Davidic monarchy, the city of Zion, and the temple of the God of Israel. It is out of that unspeakable pain that Lamentations speaks, in poetry of astonishing beauty and intricacy, though soaked in tears. If we neglect this book, says Chris Wright, we miss the challenge and reward of wrestling with the massive theological issues that permeate it. How can suffering be endured alongside faith in an all-loving, good God? Even if these events are recognized and accepted as God's judgment, has not the flood of brutality and evil gone beyond all bounds? If anarchy, death and destruction stalk the land, can the centre of Israel's faith hold? About "Message of Lamentations, The: Honest to God (Bible Speaks Today Series)"